Audacity is a popular sound recorder and audio editor. It is a capable program while still being easy to use. The majority of users are on Windows but the same Audacity source code compiles to run on Linux and Mac too. Dominic Mazzoni wrote the original version of Audacity in 1999 while he was a research student at Carnegie Mellon University. Dominic wanted to create a platform on which to develop and debug audio processing algorithms. The software grew to become useful in its own right in many other ways. Once Audacity was released as open source software, it attracted other developers. A small, gradually-changing team of enthusiasts have modified, maintained, tested, updated, written documentation for, helped users with, and translated Audacity's interface into other languages over the years. One goal is that its user interface should be discoverable: people should be able to sit down without a manual and start using it right away, gradually discovering its features. This principle has been crucial in giving Audacity greater consistency to the user interface than there otherwise would be. For a project in which many people have a hand this kind of unifying principle is more important than it might seem at first. It would be good if the architecture of Audacity had a similar guiding principle, a similar kind of discoverability. The closest we have to that is "try and be consistent". When adding new code, developers try to follow the style and conventions of code nearby. In practice, though, the Audacity code base is a mix of well-structured and less well-structured code. Rather than an overall architecture the analogy of a small city is better: there are some impressive buildings but you will also find run-down neighborhoods that are more like a shanty town. Audacity is layered upon several libraries. While most new programming in Audacity code doesn't require a detailed knowledge of exactly what is going on in these libraries, familiarity with their APIs and what they do is important. The two most important libraries are PortAudio which provides a low-level audio interface in a cross-platform way, and wxWidgets which provides GUI components in a cross-platform way. When reading Audacity's code, it helps to realize that only a fraction of the code is essential. Libraries contribute a lot of optional features—though people who use those features might not consider them optional. For example, as well as having its own built-in audio effects, Audacity supports LADSPA (Linux Audio Developer's Simple Plugin API) for dynamically loadable plugin audio effects. The VAMP API in Audacity does the same thing for plugins that analyze audio. Without these APIs, Audacity would be less feature-rich, but it does not absolutely depend on these features. Other optional libraries used by Audacity are libFLAC, libogg, and libvorbis. These provide various audio compression formats. MP3 format is catered for by dynamically loading the LAME or FFmpeg library. Licensing restrictions prevent these very popular compression libraries from being built-in. Licensing is behind some other decisions about Audacity libraries and structure. For example, support for VST plugins is not built in because of licensing restrictions. We would also like to use the very efficient FFTW fast Fourier transform code in some of our code. However, we only provide that as an option for people who compile Audacity themselves, and instead fall back to a slightly slower version in our normal builds. As long as Audacity accepts plugins, it can be and has been argued that Audacity cannot use FFTW. FFTW's authors do not want their code to be available as a general service to arbitrary other code. So, the architectural decision to support plugins leads to a trade-off in what we can offer. It makes LADSPA plugins possible but bars us from using FFTW in our pre-built executables. Architecture is also shaped by considerations of how best to use our scarce developer time. With a small team of developers, we do not have the resources to do, for example, the in-depth analysis of security loopholes that teams working on Firefox and Thunderbird do. However, we do not want Audacity to provide a route to bypass a firewall, so we have a rule not to have TCP/IP connections to or from Audacity at all. Avoiding TCP/IP cuts out many security concerns. The awareness of our limited resources leads us to better design. It helps us cut features that would cost us too much in developer time and focus on what is essential. A similar concern for developers' time applies to scripting languages. We want scripting, but the code implementing the languages does not need to be in Audacity. It does not make sense to compile copies of each scripting language into Audacity to give users all the choices they could want.1 We have instead implemented scripting with a single plugin module and a pipe, which we will cover later. Figure 2.1 shows some layers and modules in Audacity. 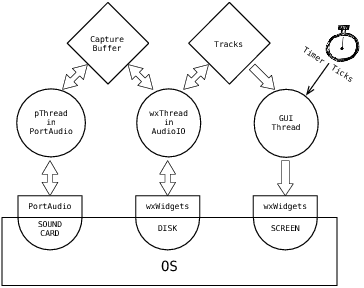 The diagram highlights three important classes within wxWidgets, each of which has a reflection in Audacity. We're building higher-level abstractions from related lower-level ones. For example, the BlockFile system is a reflection of and is built on wxWidgets' wxFiles. It might, at some stage, make sense to split out BlockFiles, ShuttleGUI, and command handling into an intermediate library in their own right. This would encourage us to make them more general. Lower down in the diagram is a narrow strip for "Platform Specific Implementation Layers." 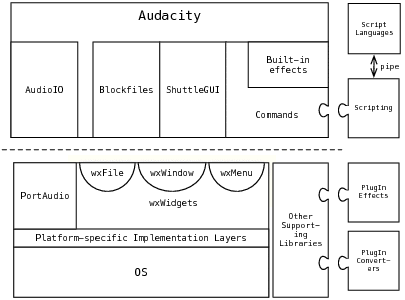 Both wxWidgets and PortAudio are OS abstraction layers. Both contain conditional code that chooses between different implementations depending on the target platform. The "Other Supporting Libraries" category includes a wide collection of libraries. Interestingly quite a few of these rely on dynamically loaded modules. Those dynamic modules know nothing of wxWidgets. On the Windows platform we used to compile Audacity as a single monolithic executable with wxWidgets and Audacity application code in the same executable. In 2008 we changed over to using a modular structure with wxWidgets as a separate DLL. This is to allow additional optional DLLs to be loaded at run time where those DLLs directly use features of wxWidgets. Plugins that plug in above the dotted line in the diagram can use wxWidgets. The decision to use DLLs for wxWidgets has its downsides. The distribution is now larger, partly because many unused functions are provided in the DLLs that would previously have been optimized away. Audacity also takes longer to start up because each DLL is loaded separately. The advantages are considerable. We expect modules to have similar advantages for us as they do for Apache. As we see it, modules allow the core of Apache to be very stable while facilitating experimentation, special features and new ideas in the modules. Modules go a very long way to counteracting the temptation to fork a project to take it in a new direction. We think it's been a very important architectural change for us. We're expecting these advantages but have not seen them yet. Exposing the wxWidgets functions is only a first step and we have more to do to have a flexible modular system. The structure of a program like Audacity clearly is not designed up front. It is something that develops over time. By and large the architecture we now have works well for us. We find ourselves fighting the architecture when we try to add features that affect many of the source files. For example, Audacity currently handles stereo and mono tracks in a special cased way. If you wanted to modify Audacity to handle surround sound you'd need to make changes in many classes in Audacity. Audacity has never had an abstraction for number of channels. Instead the abstraction it uses is to link audio channels. There is a function GetLinkthat returns the other audio channel in a pair if there are two and that returns NULL if the track is mono. Code that uses GetLink typically looks exactly as if it were originally written for mono and later a test of (GetLink() != NULL) used to extend that code to handle stereo. I'm not sure it was actually written that way, but I suspect it. There's no looping using GetLink to iterate through all channels in a linked list. Drawing, mixing, reading and writing all contain a test for the stereo case rather than general code that can work for n channels where n is most likely to be one or two. To go for the more general code you'd need to make changes at around 100 of these calls to the GetLink function modifying at least 26 files. It's easy to search the code to find GetLink calls and the changes needed are not that complex, so it is not as big a deal to fix this "problem" as it might sound at first. The GetLink story is not about a structural defect that is hard to fix. Rather it's illustrative of how a relatively small defect can travel into a lot of code, if allowed to. With hindsight it would have been good to make the GetLink function private and instead provide an iterator to iterate through all channels in a track. This would have avoided much special case code for stereo, and at the same time made code that uses the list of audio channels agnostic with respect to the list implementation. The more modular design is likely to drive us towards better hiding of internal structure. As we define and extend an external API we'll need to look more closely at the functions we're providing. This will draw our attention to abstractions that we don't want to lock in to an external API. The most significant single library for Audacity user interface programmers is the wxWidgets GUI library, which provides such things as buttons, sliders, check boxes, windows and dialogs. It provides the most visible cross-platform behavior. The wxWidgets library has its own string class wxString, it has cross-platform abstractions for threads, filesystems, and fonts, and a mechanism for localization to other languages, all of which we use. We advise people new to Audacity development to first download wxWidgets and compile and experiment with some of the samples that come with that library. wxWidgets is a relatively thin layer on the underlying GUI objects provided by the operating system. To build up complex dialogs wxWidgets provides not only individual widget elements but also sizers that control the elements' sizes and positions. This is a lot nicer than giving absolute fixed positions to graphical elements. If the widgets are resized either directly by the user or, say, by using a different font size, the positioning of the elements in the dialogs updates in a very natural way. Sizers are important for a cross-platform application. Without them we might have to have custom layouts of dialogs for each platform. Often the design for these dialogs is in a resource file that is read by the program. However in Audacity we exclusively compile dialog designs into the program as a series of calls to wxWidgets functions. This provides maximum flexibility: that is, dialogs whose exact contents and behavior will be determined by application level code. You could at one time find places in Audacity where the initial code for creating a GUI had clearly been code-generated using a graphical dialog building tool. Those tools helped us get a basic design. Over time the basic code was hacked around to add new features, resulting in many places where new dialogs were created by copying and modifying existing, already hacked-around dialog code. After a number of years of such development we found that large sections of the Audacity source code, particularly the dialogs for configuring user preferences, consisted of tangled repetitive code. That code, though simple in what it did, was surprisingly hard to follow. Part of the problem was that the sequence in which dialogs were built up was quite arbitrary: smaller elements were combined into larger ones and eventually into complete dialogs, but the order in which elements were created by the code did not (and did not need to) resemble the order elements were laid out on screen. The code was also verbose and repetitive. There was GUI-related code to transfer data from preferences stored on disk to intermediate variables, code to transfer from intermediate variables to the displayed GUI, code to transfer from the displayed GUI to intermediate variables, and code to transfer from intermediate variables to the stored preferences. There were comments in the code along the lines of //this is a mess, but it was quite some time before anything was done about it. The solution to untangling all this code was a new class, ShuttleGui, that much reduced the number of lines of code needed to specify a dialog, making the code more readable. ShuttleGui is an extra layer between the wxWidgets library and Audacity. Its job is to transfer information between the two. Here's an example which results in the GUI elements pictured in Figure 2.2. This code defines a static box in a dialog and that box contains a button and a checkbox. The correspondence between the code and the dialog should be clear. The StartStatic and EndStatic are paired calls. Other similar StartSomething/EndSomething pairs, which must match, are used for controlling other aspects of layout of the dialog. The curly brackets and the indenting that goes with them aren't needed for this to be correct code. We adopted the convention of adding them in to make the structure and particularly the matching of the paired calls obvious. It really helps readability in larger examples. The source code shown does not just create the dialog. The code after the comment "//GUI Structure" can also be used to shuttle data from the dialog out to where the user preferences are stored, and to shuttle data back in. Previously a lot of the repetitive code came from the need to do this. Nowadays that code is only written once and is buried within the ShuttleGui class. There are other extensions to the basic wxWidgets in Audacity. Audacity has its own class for managing toolbars. Why doesn't it use wxWidget's built in toolbar class? The reason is historic: Audacity's toolbars were written before wxWidgets provided a toolbar class. The main panel in Audacity which displays audio waveforms is the TrackPanel. This is a custom control drawn by Audacity. It's made up of components such as smaller panels with track information, a ruler for the timebase, rulers for amplitude, and tracks which may show waveforms, spectra or textual labels. The tracks can be resized and moved around by dragging. The tracks containing textual labels make use of our own re-implementation of an editable text box rather than using the built-in text box. You might think these panels tracks and rulers should each be a wxWidgets component, but they are not. 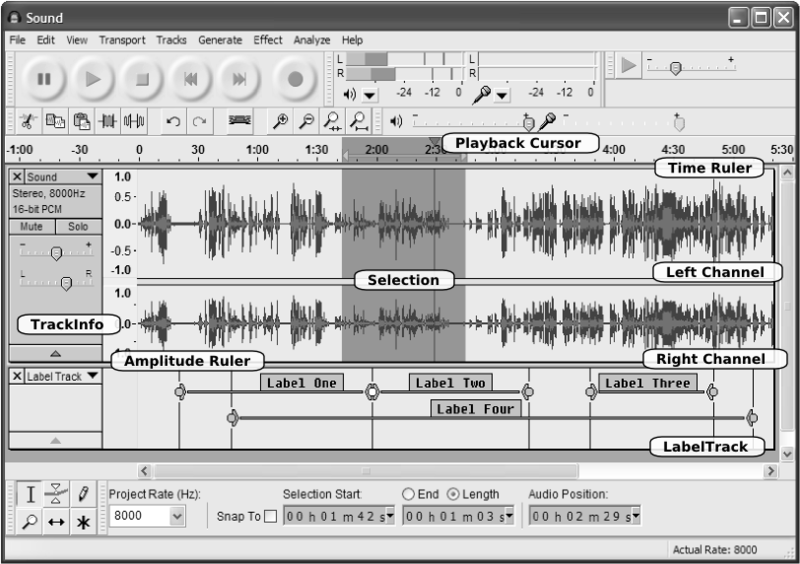 The screenshot shown in Figure 2.3 shows the Audacity user interface. All the components that have been labelled are custom for Audacity. As far as wxWidgets is concerned there is one wxWidget component for the TrackPanel. Audacity code, not wxWidgets, takes care of the positioning and repainting within that. The way all these components fit together to make the TrackPanel is truly horrible. (It's the code that's horrible; the end result the user sees looks just fine.) The GUI and application-specific code is all mixed together, not separated cleanly. In a good design only our application-specific code should know about left and right audio channels, decibels, muting and soloing. GUI elements should be application agnostic elements that are reusable in a non-audio application. Even the purely GUI parts of TrackPanel are a patchwork of special case code with absolute positions and sizes and not enough abstraction. It would be so much nicer, cleaner and more consistent if these special components were self-contained GUI elements and if they used sizers with the same kinds of interface as wxWidgets uses. To get to such a TrackPanel we'd need a new sizer for wxWidgets that can move and resize tracks or, indeed, any other widget. wxWidgets sizers aren't yet that flexible. As a spin off benefit we could use that sizer elsewhere. We could use it in the toolbars that hold the buttons, making it easy to customize the order of buttons within a toolbar by dragging. Some exploratory work has been done in creating and using such sizers, but not enough. Some experiments with making the GUI components fully fledged wxWidgets ran into a problem: doing so reduces our control over repainting of the widgets, resulting in flicker when resizing and moving components. We would need to extensively modify wxWidgets to achieve flicker-free repainting, and better separate the resizing steps from the repainting steps. A second reason to be wary of this approach for the TrackPanel is that we already know wxWidgets start running very slowly when there are large numbers of widgets. This is mostly outside of wxWidget's control. Each wxWidget, button, and text entry box uses a resource from the windowing system. Each has a handle to access it. Processing large numbers of these takes time. Processing is slow even when the majority of widgets are hidden or off screen. We want to be able to use many small widgets on our tracks. The best solution is to use a flyweight pattern, lightweight widgets that we draw ourselves, which do not have corresponding objects that consume windowing system resources or handles. We would use a structure like wxWidgets's sizers and component widgets, and give the components a similar API but not actually derive from wxWidgets classes. We'd be refactoring our existing TrackPanel code so that its structure became a lot clearer. If this were an easy solution it would already have been done, but diverging opinions about exactly what we want to end up with derailed an earlier attempt. Generalizing our current ad hoc approach would take significant design work and coding. There is a great temptation to leave complex code that already works well enough alone. PortAudio is the audio library that gives Audacity the ability to play and record audio in a cross-platform way. Without it Audacity would not be able to use the sound card of the device it's running on. PortAudio provides the ring buffers, sample rate conversion when playing/recording and, crucially, provides an API that hides the differences between audio on Mac, Linux and Windows. Within PortAudio there are alternative implementation files to support this API for each platform. I've never needed to dig into PortAudio to follow what happens inside. It is, however, useful to know how we interface with PortAudio. Audacity accepts data packets from PortAudio (recording) and sends packets to PortAudio (playback). It's worth looking at exactly how the sending and receiving happens, and how it fits in with reading and writing to disk and updates to the screen. Several different processes are going on at the same time. Some happen frequently, transfer small amounts of data, and must be responded to quickly. Others happen less frequently, transfer larger quantities of data, and the exact timing of when they happen is less critical. This is an impedance mismatch between the processes, and buffers are used to accommodate it. A second part of the picture is that we are dealing with audio devices, hard drives, and the screen. We don't go down to the wire and so have to work with the APIs we're given. Whilst we would like each of our processes to look similar, for example to have each running from a wxThread, we don't have that luxury (Figure 2.4). One audio thread is started by PortAudio code and interacts directly with the audio device. This is what drives recording or playback. This thread has to be responsive or packets will get lost. The thread, under the control of PortAudio code, calls audacityAudioCallback which, when recording, adds newly arrived small packets to a larger (five second) capture buffer. When playing back it takes small chunks off a five second playback buffer. The PortAudio library knows nothing about wxWidgets and so this thread created by PortAudio is a pthread. A second thread is started by code in Audacity's class AudioIO. When recording, AudioIO takes the data from the capture buffer and appends it to Audacity's tracks so that it will eventually get displayed. Additionally, when enough data has been added, AudioIO writes the data to disk. This same thread also does the disk reads for audio playback. The function AudioIO::FillBuffers is the key function here and depending on the settings of some Boolean variables, handles both recording and playback in the one function. It's important that the one function handle both directions. Both the recording and playback parts are used at the same time when doing "software play through," where you overdub what was previously recorded. In the AudioIO thread we are totally at the mercy of the operating system's disk IO. We may stall for an unknown length of time reading or writing to a disk. We could not do those reads or writes in audacityAudioCallback because of the need to be responsive there. Communication between these two threads happens via shared variables. Because we control which threads are writing to these variables and when, we avoid the need for more expensive mutexes. In both playback and recording, there is an additional requirement: Audacity also needs to update the GUI. This is the least time critical operation. The update happens in the main GUI thread and is due to a periodic timer that ticks twenty times a second. This timer's tick causes TrackPanel::OnTimer to be called, and if updates to the GUI are found to be needed, they are applied. This main GUI thread is created within wxWidgets rather than by our own code. It is special in that other threads cannot directly update the GUI. Using a timer to get the GUI thread to check if it needs to update the screen allows us to reduce the number of repaints to a level that is acceptable for a responsive display, and not make too heavy demands on processor time for displaying. Is it good design to have an audio device thread, a buffer/disk thread and a GUI thread with periodic timer to handle these audio data transfers? It is somewhat ad hoc to have these three different threads that are not based on a single abstract base class. However, the ad-hockery is largely dictated by the libraries we use. PortAudio expects to create a thread itself. The wxWidgets framework automatically has a GUI thread. Our need for a buffer filling thread is dictated by our need to fix the impedance mismatch between the frequent small packets of the audio device thread and the less frequent larger packets of the disk drive. There is very clear benefit in using these libraries. The cost in using the libraries is that we end up using the abstractions they provide. As a result we copy data in memory from one place to another more than is strictly necessary. In fast data switches I've worked on, I've seen extremely efficient code for handling these kinds of impedance mismatches that is interrupt driven and does not use threads at all. Pointers to buffers are passed around rather than copying data. You can only do that if the libraries you are using are designed with a richer buffer abstraction. Using the existing interfaces, we're forced to use threads and we're forced to copy data. One of the challenges faced by Audacity is supporting insertions and deletions into audio recordings that may be hours long. Recordings can easily be too long to fit in available RAM. If an audio recording is in a single disk file, inserting audio somewhere near the start of that file could mean moving a lot of data to make way. Copying that data on disk would be time consuming and mean that Audacity could then not respond rapidly to simple edits. Audacity's solution to this is to divide audio files into many BlockFiles, each of which could be around 1 MB. This is the main reason Audacity has its own audio file format, a master file with the extension .aup. It is an XML file which coordinates the various blocks. Changes near the start of a long audio recording might affect just one block and the master .aup file. BlockFiles balance two conflicting forces. We can insert and delete audio without excessive copying, and during playback we are guaranteed to get reasonably large chunks of audio with each request to the disk. The smaller the blocks, the more potential disk requests to fetch the same amount of audio data; the larger the blocks, the more copying on insertions and deletions. Audacity's BlockFiles never have internal free space and they never grow beyond the maximum block size. To keep this true when we insert or delete we may end up copying up to one block's worth of data. When we don't need a BlockFile anymore we delete it. The BlockFiles are reference counted so if we delete some audio, the relevant BlockFiles will still hang around to support the undo mechanism until we save. There is never a need to garbage collect free space within Audacity BlockFiles, which we would need to do with an all-in-one-file approach. Merging and splitting larger chunks of data is the bread and butter of data management systems, from B-trees to Google's BigTable tablets to the management of unrolled linked lists. Figure 2.5 shows what happens in Audacity when removing a span of audio near the start. 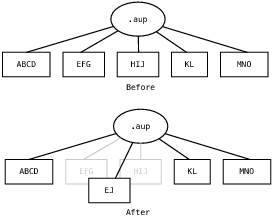 Figure 2.5: Before deletion, .aup file and BlockFiles hold the sequence ABCDEFGHIJKLMNO. After deletion of FGHI, two BlockFiles are merged. BlockFiles aren't just used for the audio itself. There are also BlockFiles that cache summary information. If Audacity is asked to display a four hour long recording on screen it is not acceptable for it to process the entire audio each time it redraws the screen. Instead it uses summary information which gives the maximum and minimum audio amplitude over ranges of time. When zoomed in, Audacity is drawing using actual samples. When zoomed out, Audacity is drawing using summary information. A refinement in the BlockFile system is that the blocks needn't be files created by Audacity. They can be references to subsections of audio files such as a timespan from audio stored in the .wav format. A user can create an Audacity project, import audio from a .wav file and mix a number of tracks whilst only creating BlockFiles for the summary information. This saves disk space and saves time in copying audio. All told it is, however, a rather bad idea. Far too many of our users have removed the original audio .wav file thinking there will be a complete copy in the Audacity project folder. That's not so and without the original .wav file the audio project can no longer be played. The default in Audacity nowadays is to always copy imported audio, creating new BlockFiles in the process. The BlockFile solution ran into problems on Windows systems where having a large number of BlockFiles performed very poorly. This appeared to be because Windows was much slower handling files when there were many in the same directory, a similar problem to the slowdown with large numbers of widgets. A later addition was made to use a hierarchy of subdirectories, never with more than a hundred files in each subdirectory. The main problem with the BlockFile structure is that it is exposed to end users. We often hear from users who move the .aup file and don't realize they also need to move the folder containing all the BlockFiles too. It would be better if Audacity projects were a single file with Audacity taking responsibility for how the space inside the file is used. If anything this would increase performance rather than reduce it. The main additional code needed would be for garbage collection. A simple approach to that would be to copy the blocks to a new file when saving if more than a set percentage of the file were unused. Audacity has an experimental plugin that supports multiple scripting languages. It provides a scripting interface over a named pipe. The commands exposed via scripting are in a textual format, as are the responses. As long as the user's scripting language can write text to and read text from a named pipe, the scripting language can drive Audacity. Audio and other high-volume data does not need to travel on the pipe (Figure 2.6). The plugin itself knows nothing about the content of the text traffic that it carries. It is only responsible for conveying it. The plugin interface (or rudimentary extension point) used by the scripting plugin to plug in to Audacity already exposes Audacity commands in textual format. So, the scripting plugin is small, its main content being code for the pipe. Unfortunately a pipe introduces similar security risks to having a TCP/IP connection—and we've ruled out TCP/IP connections for Audacity on security grounds. To reduce that risk the plugin is an optional DLL. You have to make a deliberate decision to obtain and use it and it comes with a health/security warning. After the scripting feature had already been started, a suggestion surfaced in the feature requests page of our wiki that we should consider using KDE's D-Bus standard to provide an inter-process call mechanism using TCP/IP. We'd already started going down a different route but it still might make sense to adapt the interface we've ended up with to support D-Bus. The scripting feature grew from an enthusiast's adaptation of Audacity for a particular need that was heading in the direction of being a fork. These features, together called CleanSpeech, provide for mp3 conversion of sermons. CleanSpeech adds new effects such as truncate silence—the effect finds and cuts out long silences in audio—and the ability to apply a fixed sequence of existing noise removal effects, normalization and mp3 conversion to a whole batch of audio recordings. We wanted some of the excellent functionality in this, but the way it was written was too special case for Audacity. Bringing it into mainstream Audacity led us to code for a flexible sequence rather than a fixed sequence. The flexible sequence could use any of the effects via a look-up table for command names and a Shuttle class to persist the command parameters to a textual format in user preferences. This feature is called batch chains. Very deliberately we stopped short of adding conditionals or calculation to avoid inventing an ad hoc scripting language. In retrospect the effort to avoid a fork has been well worthwhile. There is still a CleanSpeech mode buried in Audacity that can be set by modifying a preference. It also cuts down the user interface, removing advanced features. A simplified version of Audacity has been requested for other uses, most notably in schools. The problem is that each person's view of which are the advanced features and which are the essential ones is different. We've subsequently implemented a simple hack that leverages the translation mechanism. When the translation of a menu item starts with a "#" it is no longer shown in the menus. That way people who want to reduce the menus can make choices themselves without recompiling—more general and less invasive than the mCleanspeech flag in Audacity, which in time we may be able to remove entirely. The CleanSpeech work gave us batch chains and the ability to truncate silence. Both have attracted additional improvement from outside the core team. Batch chains directly led on to the scripting feature. That in turn has begun the process of supporting more general purpose plugins to adapt Audacity. Audacity does not have real-time effects, that is, audio effects that are calculated on demand as the audio plays. Instead in Audacity you apply an effect and must wait for it to complete. Real-time effects and rendering of audio effects in the background whilst the user interface stays responsive are among the most frequently made feature requests for Audacity. A problem we have is that what may be a real-time effect on one machine may not run fast enough to be real-time on a much slower machine. Audacity runs on a wide range of machines. We'd like a graceful fallback. On a slower machine we'd still want to be able to request an effect be applied to an entire track and to then listen to the processed audio near the middle of the track, after a small wait, with Audacity knowing to process that part first. On a machine too slow to render the effect in real time we'd be able to listen to the audio until playback caught up with the rendering. To do this we'd need to remove the restrictions that audio effects hold up the user interface and that the order of processing the audio blocks is strictly left to right. A relatively recent addition in Audacity called on demand loading has many of the elements we need for real time effects, though it doesn't involve audio effects at all. When you import an audio file into Audacity, it can now make the summary BlockFiles in a background task. Audacity will show a placeholder of diagonal blue and gray stripes for audio that it has not yet processed and respond to many user commands whilst the audio is still being loaded. The blocks do not have to be processed in left-to-right order. The intention has always been that the same code will in due course be used for real-time effects. On demand loading gives us an evolutionary approach to adding real time effects. It's a step that avoids some of the complexities of making the effects themselves real-time. Real-time effects will additionally need overlap between the blocks, otherwise effects like echo will not join up correctly. We'll also need to allow parameters to vary as the audio is playing. By doing on demand loading first, the code gets used at an earlier stage than it otherwise would. It will get feedback and refinement from actual use. The earlier sections of this chapter illustrate how good structure contribute to a program's growth, or how the absence of good structure hinders it. Third party APIs such as PortAudio and wxWidgets have been of huge benefit. They've given us code that works to build on, and abstracted away many platform differences. One price we pay for using them is that we don't get the flexibility to choose the abstractions. We have less than pretty code for playback and recording because we have to handle threading in three different ways. The code also does more copying of data than it could do if we controlled the abstractions. The API given to us by wxWidgets tempted us into writing some verbose, hard to follow application code. Our solution to that was to add a facade in front of wxWidgets to give us the abstractions we wanted and cleaner application code. In the TrackPanel of Audacity we needed to go outside the features that could easily be got from existing widgets. As a result we rolled our own ad hoc system. There is a cleaner system with widgets and sizers and logically distinct application level objects struggling to come out of the TrackPanel. Structural decisions are wider ranging than deciding how to structure new features. A decision about what not to include in a program can be as important. It can lead to cleaner, safer code. It's a pleasure to get the benefits of scripting languages like Perl without having to do the work of maintaining our own copy. Structural decisions also are driven by plans for future growth. Our embryonic modular system is expected to lead to more experimentation by making experiments safer. On demand loading is expected to be an evolutionary step towards on demand processing of real time effects. The more you look, the more obvious it is that Audacity is a community effort. The community is larger than just those contributing directly because it depends on libraries, each of which has its own community with its own domain experts. Having read about the mix of structure in Audacity it probably comes as no surprise that the community developing it welcomes new developers and is well able to handle a wide range of skill levels. For me there is no question that the nature of the community behind Audacity is reflected in the strengths and weaknesses of the code. A more closed group could write high quality code more consistently than we have, but it would be harder to match the range of capabilities Audacity has with fewer people contributing. The one exception to this is the Lisp-based Nyquist language which has been built into Audacity from very early days. We would like to make it a separate module, bundled with Audacity, but we have not yet had the time to make that change.